Sometimes a plastic pen is just the thing. At company picnics, for instance, an abundance of colorful plastic pens with logos is just the thing for keeping score of games or handing out affordable prizes. Your next convention's swag table will benefit from promotional plastic pens that brag about your goods and services. And plastic printed pens are always great for giving out to clients and prospects. The Javalina Tropical Pen - Pink features a dual color neon design and hourglass shaped slim barrel. The 3-In-1 Pen is a useful writing implement that is available in three ink colors; red, blue, and black. It is available in attractive white, with a color trim including: black or blue colors. The Acadia Pen is a pen that is available in primary colors. This classic pen has a white barrel, with black, blue or red trim and rubber grip. 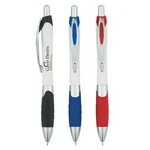 Our accent B plastic click pen features a colored plastic barrel with metal clip and chrome accents. This Ace ballpoint click pen includes a colored barrel with black clip and grip and a click action mechanism. This Alabama click pen features a silver barrel with a colored grip and uses click action. Our Aniston twist pen comes in your choice of colored barrel with metal clip and uses a twist action mechanism. 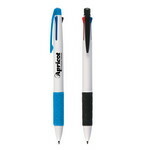 The Aspen click action pen has a silver barrel with color rubber and clip. This Baroness metal clip click pen includes a translucent plastic barrel, black grip, metal chrome clip makes and uses click action mechanism. This Bates click pen features a colored barrel, metal clip and gold trim with a click action mechanism. The Belfast translucent ballpoint stick pen is a slim pen with frosted barrel and removable cap. The Belize retractable ballpoint pen features a sleek color design and comfort grip barrel for writing ease.